The field of quantum computing is at an inflection point. The past haunts those who fear another quantum winter – a period when research dies of neglect as funding cools. However, there’s an unofficial club full of optimists who are, quite literally, willing to take on quantum’s demons. A team of researchers at Penn State just realized, in the physical world, a famous thought experiment called Maxwell’s Demon. This is a big deal for quantum computers. It could aid in resolving one of the biggest problems with quantum computing: Entropy, in the form of noisy qubits. In 1867 renowned physicist James Maxwell proposed a thought experiment where atoms were trapped in a box with a gate separating them on two sides. The atoms in the box were either fast moving or slow moving, thus either hot or cool. He imagined a demon capable of opening the gate and letting only certain atoms through. 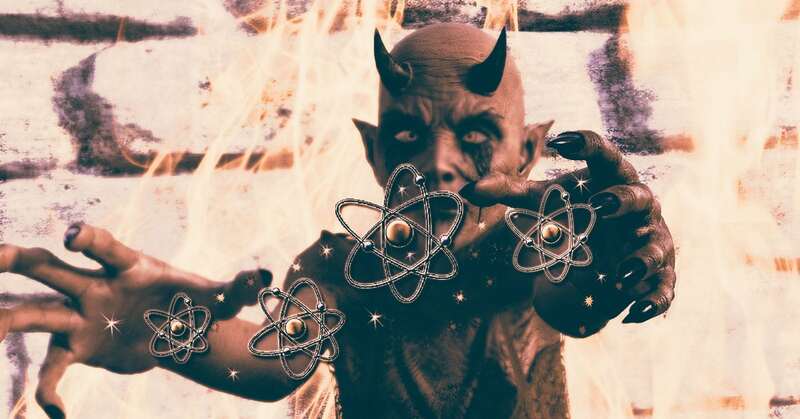 By controlling the temperature of the box through lowering the entropy of the mixed atoms, the demon could create energy without expending any. This, scientists thought, defied the 2nd law of thermodynamics (the total entropy of an isolated system can never decrease over time) and was impossible. Enter Penn State. The team accomplished this by using lasers to trap and arrange atoms across a three dimensional 5x5x5 grid. Once trapped, scientists controlled the atoms by adjusting the polarity of the traps. The atoms are then super-cooled, which allows scientists to contain the entropy of the system. In essence, this works around the noise problem. Maxwell’s vision of a demon capable of reducing the entropy of an isolated system came nearly 100 years before the invention of the laser. And that’s not the only good news for quantum lovers to hang their hats on. If winter is coming for quantum, it’s going to surprise a lot of invested people. Quantum computing startup Rigetti just unveiled a 128-qubit computer and a new hybrid quantum computing platform for developers. TNW spoke with Whurley, the CEO of quantum computing startup Strangeworks, one of Rigetti’s developer partners on the hybrid cloud system. He told TNW that his company was excited to be working with Rigetti because, to the best of his knowledge, this project was the only one dedicated to combining quantum and classical systems and providing developers with cloud access to these hybrid machines. I laugh when people talk about quantum supremacy. Quantum computers don’t work without being attached to a classical computer, so how supreme can they be? Quantum supremacy is the idea that, at some point, a quantum computer will be able to do any task better than a classical computer. A lot of experts, Whurley included, feel that’s a short-sighted way to view things. Most of the talk surrounding “supremacy” is based on speculation tied to arbitrary benchmarks such as the amount of qubits researchers can squeeze into one quantum system. You can’t generically say ‘at this specific number of qubits we’ll have useful quantum systems.’ What kind of qubits are we talking about? … Adding another qubit isn’t the hard part, it’s adding another qubit and dealing with the noise. The future remains unwritten, and there are no guarantees against a quantum winter. The next ‘save point’ on humanity’s journey towards useful quantum computing systems is getting them into the hands of developers — with current technology you need to be a physicist to operate a quantum computer. Rigetti’s hybrid systems in the cloud, and Penn State’s conquering of Maxwell’s demon, are giant leaps toward that goal.